As the outdoor air temperature shows signs of warming, it is still critical that all RPU water customers continue to monitor their water temperature. If customers are running a constant pencil-width stream of water, it is important that they continue to run their faucet for the next two months. With a frost level of nearly six feet below the ground, it will take a significant string of warm, sunny days to penetrate the frost level. RPU water experts suggest that because of such a significant frost level that the frost may be in the ground well into April. View real-time frost level readings for Rochester on the RPU website www.rpu.org. A frozen water service repair can cost between $800- $1,000. The cost to run a constant pencil-width stream of water is approximately $40- $60 per month including sewer fees. If you are going to be letting your water run, please contact RPU at 507.280.1500 during regular business hours. All businesses and residence types could be affected. The age of your home does not matter. Q- Which faucet do I test from? A- Turn your cold water on. 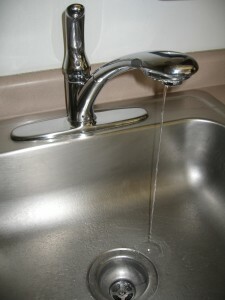 Use only your cold water faucet or turn your water to only the cold setting. Q- Will I get a credit on my water if I have to run a pencil-width stream for the next two months? A- No, there is no water credit for running your water to prevent freezing, but your sewer base will be adjusted in April. Q- What kind of thermometer do I use to test my water? A- A basic outdoor thermometer should be fine. Do not use a meat thermometer. Hold the tip in the stream of cold water for an accurate reading. 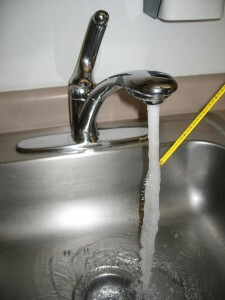 Q- If my water temperature is below 40 degrees Fahrenheit, how long do I have to run the pencil-width stream of water? A- A safe time to run the constant stream is for two months. Make sure to call RPU (507.280.1500) during regular business hours to let them know that you will be running a constant stream. Even if you are home and using water, that stream should be left running. Q- What are RPU’s water rates? Nearly 70 frozen water services have been reported to RPU this winter. In an average year two or three frozen water services would be reported. Every RPU water customers is urged to take the temperature of their water and then continue monitoring it for the next two months. If your water temperature gets below 40 degrees Fahrenheit, you should immediately start running a continuous pencil-width stream of water from a faucet. A limited amount of thermometers are available at the RPU service center to use during this time. The frost level has been measured by RPU crews as deep as six feet below the ground level, which is much deeper than recorded levels over the past 20-30 years. If more water services freeze, customers could be without water for two to three days before a repair can be made due to many plumbing contractors being overwhelmed with calls. A frozen water service repair can cost between $800- $1,000. The cost to run a constant pencil-width stream of water is approximately $40- $60 per month including sewer fees. If you are going to be letting your water run, please contact RPU at 507.280.1500. For more information, please contact Tony Benson at 507-280-1534 or email at tbenson@rpu.org. You are currently browsing the Rochester Public Utilities | Behind the Meter blog archives for February, 2014.